I’ve been in Vvardenfell for so long now, traipsing across its eerie volcanic plains, over its majestic fungal plateaus and through its singular bone cities. A dream life, really, but the senses can only experience so much wonder before wonder becomes ordinary. The Elder Scrolls 6 is still a (long, long) ways off, but Bethesda have confirmed the only news about it that truly matters: YouTuber and grandmother Shirley Curry will be included in the game. Last year, fans rallied to get her added as an NPC, and the developers have obliged, inviting Curry to their studios have her likeness scanned and saved for use in their development magic. The future is here and it s nice sometimes, actually. Morrowind, the third and greatest instalment in Bethesda’s Elder Scrolls series, has been back in the news this week. It was briefly free to celebrate the 25th anniversary of the series, and then made a brief return to Steam’s top sellers, thanks to discounts and coverage. Which is lovely: it shows its age in many, many painful ways, but its imagination, ambition and wonderfully weird visual design to this day makes Oblivion and Skyrim seem so terribly ordinary. Gun it up today, for the very first time, and you’ll think me completely mad to say that, however. It’s basically a world of fog and people who look like they were whittled from fallen branches. But, thanks to 17 years of mods, it now only takes a couple of installations and a tiny amount of work to make it stunning in the ways that most count. If you’re about to play, quickly do these things first. To celebrate a quarter-century of Elves, Daedra and cat-people with bafflingly complex lore, Bethesda are giving away The Elder Scrolls 3: Morrowind today (March 25th) only, so snap it up quickly here. You’ll need a Bethesda.net account and their launcher to grab the game, too. A bit of a hassle, but you’re getting a sprawling adventure through a deeply alien corner of Tamriel, filled with giant insects, inscrutable demigods and enough Cliff Racers to drive any adventurer to distraction. If you’ve never played what many consider the best Elder Scrolls game, now’s the time. Have you played The Elder Scrolls III: Morrowind? There are so many elements of this story which elicit slow, confused blinking from me, but honestly, the revelation that an Elder Scrolls V: Skyrim mod has been pulling in $25,000 per month from Patreon was the one which really twisted my melon. 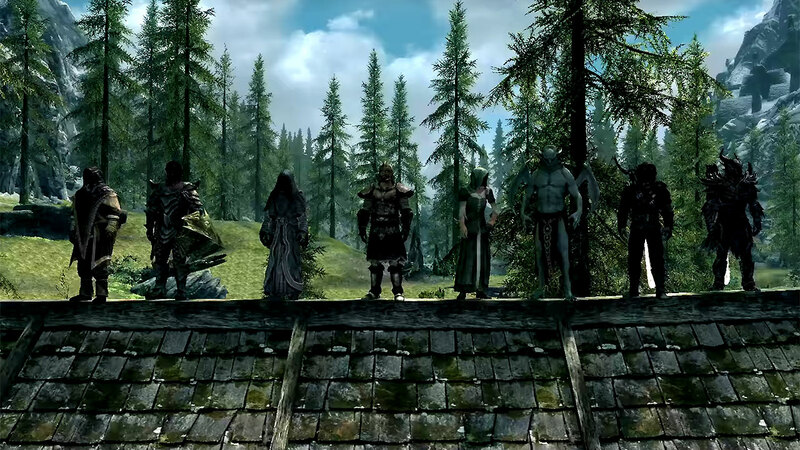 Unfortunately, the rainbow which leads to online multiplayer mod Skyrim Together‘s pot of gold has lost a little of its lustre this week, following an acknowledgement that its developers had pilfered code from another mod. Enderal: Forgotten Stories is out now on Steam, making it the first Skyrim mod to launch as a (mostly) standalone game with achievements, cloud save support and even its own mod workshop. Set in its own, somewhat darker and grittier fantasy universe, Enderal is a well-known total conversion mod from SureAI, with this free Steam release being an expanded and polished edition. You’ll need the original version of Skyrim, but otherwise it can be installed as a totally separate game. Sadly, if you only have Skyrim: Special Edition, you’ll need to grab the original version too. After some behind-the-scenes wrangling with Valve, Enderal: Forgotten Stories hits Steam next Thursday, February 14th as a free, standalone game for anyone who owns Skyrim. Originally a mere mod (set in its own world entirely separate from The Elder Scrolls), you won’t even need Skyrim installed to play this version of Enderal. Developers SureAI say the Forgotten Stories version boasts more quest-lines, new character classes, a new (hidden) ending and other upgrades – it even has its own Steam Workshop for mods. See the very dramatic new trailer below. Here’s one to put on your Fus Ra-Dar. A Skyrim multiplayer mod is about to enter closed beta, and will soon offer you and up to seven friends the chance to explore the snowy bit of Tamriel together. The devs say the closed beta won’t last long, and an open one will be hot on its heels. It is worth bearing in mind that they said the mod was almost ready back in 2017. You’d be forgiven for thinking it would (Duh) Neh Viir come out, but if you Lis Slen Nuz your doubts should be set to rest. The Elder Scrolls Online is both an attempt to further the Elder Scrolls formula into something more dynamic and living, and a game that often seems dependent on nostalgia for its continued existence. 2017’s Morrowind expansion took us back to Elder Scrolls’ finest hour, last year’s Summerset was our first return to a land not seen since Arena, the original Scrolls game, and next, here be dragons. Again. And also many, many cat-people. Pictured above is a photo of my cat wearing a promotional Skyrim hat in 2012. On brand, yeah?